I am a little homesick for Chicago. I’m missing family, friends and the fun times at baseball games. 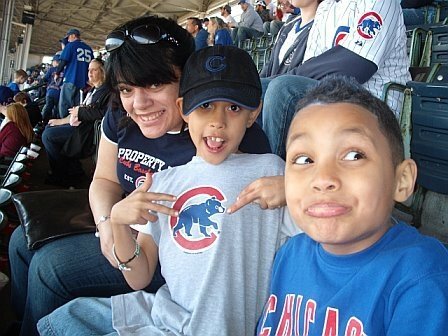 As a die-hard Cubs fan, I was so excited to take my nephews to their first Cubs game last year. I’m from Chicago too, but I now live about 50 miles west of Chicago near the Fox River. I love it out this way too because if I want to visit Chicago it’s not that far away, but it would only be a visit I don’t want to live there anymore. The neighborhoods are changing so fast, but the baseball games are still cool. Have a great day. I’m your latest follower. Ahhhh, look how happy & excited everyone is! Love it, great shot! Oh, that looks like a great time! I want to go to a game!